Drumming is the heart beat of a pipe band. We are excited to have some many drummers participating not only in numerous bands, but also competing as soloists. Solo competition is the place for drummers to show their “stuff.” They practice for hours and hours by themselves and more hours and hours within a band situation. This is a real commitment to their craft and to music. Please stop and appreciate their skills; enjoy their music. The goal of the Jimmy Brown Memorial Drumming Competition is to encourage the pursuit of drumming excellence. The Jimmy Brown Perpetual Drumming Trophy is dedicated to the spirit of competition and to the memory of Jimmy Brown, a dedicated family man and bandsman. 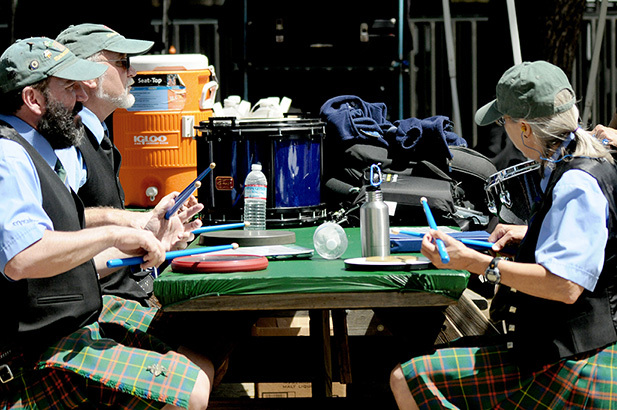 A perennial special event only at the Woodland Celtic Games & Festival is the drumming competition in honor of Scottish percussionist Jimmy Brown, who lost his battle with cancer in October 2007. Jimmy Brown was born in Cambustlang, South Lanarkshire, Scotland in 1936. He was an avid drummer through his youth in the Boys Brigade, a Christian Youth Organization in Scotland. Later, he was a regimental drummer in the British Army’s Royal Army Service Corps (RASC). 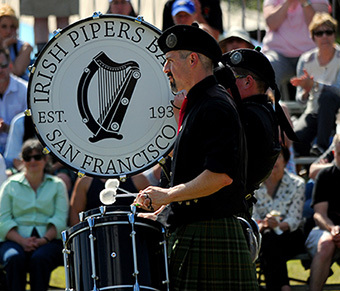 After emigrating to the United States, Jimmy played with San Francisco Bay Area-based pipe bands, including the City of San Francisco Caledonian Pipe Band, Lockheed Pipe Band of Sunnyvale, and Royal Canadian Legion Pipe Band of San Jose during the 1960s. In these Grade II bands, he competed throughout California, including our Games in Woodland. His son, Drew, remembers his father’s bands doing quite well. Jimmy was a quiet man who enjoyed simple pleasures, and particularly loved Highland music and drumming. When he retired, he and his wife, Janet, moved to Placer County, where his health then declined and he had to end his drumming “career.” But he truly enjoyed attending the previous Sacramento Valley Scottish Games & Festival and would have enjoyed the new Woodland Celtic Games & Festival. Jimmy passed away of cancer in October of 2007. He is survived by his wife, son and family. Drew Brown has been a member of the Caledonian Club of Sacramento for a number of years, and carries on the family’s musical tradition. He is a student of piping, playing with the City of Sacramento Pipe Band.